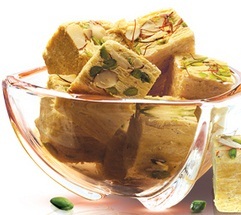 Sohan Papdi: Sohan Papdi (also known as Son Papri or Soan Papdi) is a popular Indian dessert. Sohan papdi is usually square in shape or served as flakes, and has a crisp and flaky texture. The main ingredients for sohan papdi are sugar, gram flour derived from chick peas, all purpose flour, ghee, milk and cardamom. Mix gram flour with all purpose flour together in a bowl. Heat the ghee in a heavy saucepan, on low flame. Roast the flour mixture till its golden brown in colour. Stir continuously, till the mixture cools down to the room temperature. Keep boiling the sugar syrup for 15-20 minutes or till the syrup becomes of 1 string consistency. Mix the roasted flour mixture to the sugar syrup. Beat it well with a large fork until the mixture makes thread like flakes. Transfer all the mixture into a greased surface. Roll the mixture to one inch thickness. Sprinkle and push down the dried melon seeds. Let the flattened mixture cool down to the room temperature. Cut the flattened mixture into one inch squares. Wrap all the sohan papdi pieces separately with a cling film sheet. Store the sohan papdi’s in a sealed container. Take care that the sohan papdi pieces do not come into contact with air for longer periods of time, as the moisture in the air will make the sohan papdi pieces soggy.